1903 June 29th. Born in Hampstead, London, the only son of Semmy Joseph Blumlein (1863–1914), a German businessman in mining, and his wife, Jessie Edward Dower, daughter of a Scottish missionary. Educated at various schools, including Highgate School. 1923 Appointed an assistant demonstrator. With Professor Edward Mallett, Blumlein devised a new method of high-frequency resistance measurement; joint paper was awarded a premium by the Institution of Electrical Engineers in 1925. 1924 Joined the Western-Electric Co in September, where he worked on telephony, on loading coils, and the reduction of cross-talk and electrical interference. Invented the transformer ratio arm bridge. 1929 appointed by the Columbia Graphophone Co to work on monophonic sound recording and reproduction, to circumvent the Western Electric patents on electrical recording. c.1930–31 interest in stereophonic recording and reproduction which resulted in one of the classic patents of the electrical recording literature. 1931 After formation of EMI, worked on the new all-electronic, high-definition television service. Patents on camera tubes, camera mosaics, wide-band amplifiers of all types, modulators, pulse circuits, power supplies, transmission lines, antennas, test equipment, and electronic circuits generally. 1933 Married Doreen Lane (1908–1989), daughter of W. H. Lane, auctioneer and estate agent. Their sons, Simon and David, were born in 1936 and 1939 respectively. 1939 The threat of war stimulated Blumlein and Eric Lawrence Casling White to design and demonstrate a 60 MHz radar for EMI. WWII Blumlein applied his binaural concepts to the problem of the sound location of enemy aircraft; designed a low-level altimeter for the RAF. With White developed air interception (AI) radar which was of great importance for night fighters. 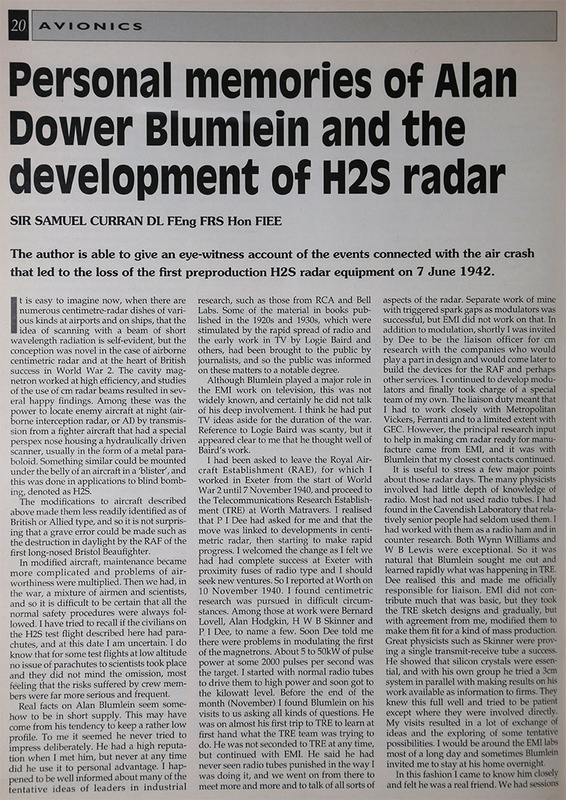 Also worked on the navigation radar H2S and its adaptation for locating enemy U-boats, and other types of radar. 1942 June 7th. Killed while flight testing an experimental H2S Radar set over the Wye valley. In total he gained 128 patents in a wide range of fields - telephony, electrical measurements, sound recording and sound reproduction (both monophonic and stereophonic), high-definition television, radar, and electronics generally. 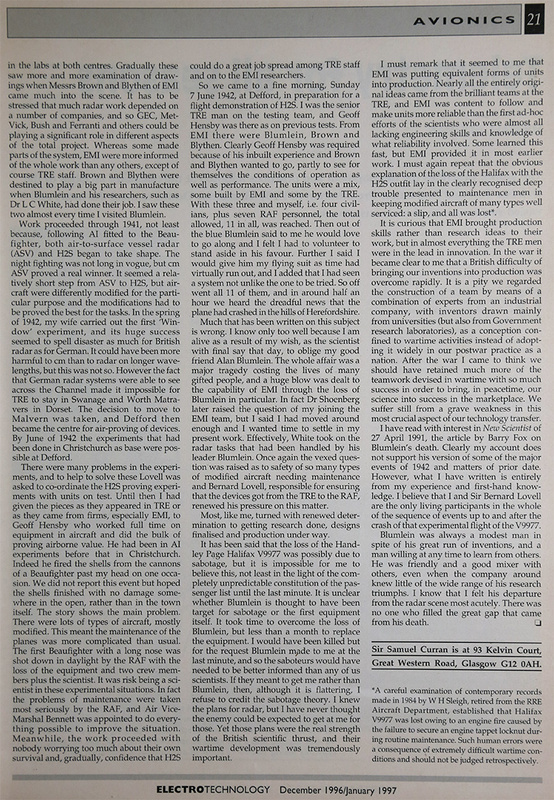 1958 Posthumous citation by the Audio Engineering Society of the USA for his work on stereophony. This page was last edited on 21 November 2018, at 15:28.